Mungkin bagi Anda yang mengenal komputer mulai di Windows XP tidak banyak yang mengenal MS DOS, mungkin bisa dikatakan tidak tahu, kali ini saya akan memberikan beberapa Command/perintah dan arti di dalam sistem operasi MS DOS. Saya biasanya menggunakan perintah dalam DOS untuk mengcopy file yang masih selamat dari virus..
APPEND : Causes MS-DOS to look in other directories when editing a file or running a command. AT : Schedule a time to execute commands or programs. ATMADM : Lists connections and addresses seen by Windows ATM call manager. ATTRIB : Display and change file attributes. BATCH : NRecovery console command that executes a series of commands in a file. BREAK : Enable / disable CTRL + C feature. CACLS : View and modify file ACL's. CALL : Calls a batch file from another batch file. CHCP : Supplement the International keyboard and character set information. CHKDSK : Check the hard disk drive running FAT for errors. CHKNTFS : Check the hard disk drive running NTFS for errors. CHOICE : Specify a listing of multiple options within a batch file. CLS : Clears the screen. CMD : Opens the command interpreter. COLOR : Easily change the foreground and background color of the MS-DOS window. COMPACT : Compresses and uncompress files. CONTROL : Open control panel icons from the MS-DOS prompt. CONVERT : Convert FAT to NTFS. COPY : Copy one or more files to an alternate location. CTTY : Change the computers input/output devices. DATE : View or change the systems date. DEBUG : Debug utility to create assembly programs to modify hardware settings. DEFRAG : Re-arrange the hard disk drive to help with loading programs. DEL : Deletes one or more files. DELETE : Recovery console command that deletes a file. DELTREE : Deletes one or more files and/or directories. DIR : List the contents of one or more directory. DISABLE : Recovery console command that disables Windows system services or drivers. DISKCOMP : Compare a disk with another disk. DOSKEY : Command to view and execute commands that have been run in the past. DOSSHELL : A GUI to help with early MS-DOS users. DRIVPARM : Enables overwrite of original device drivers. ECHO : Displays messages and enables and disables echo. EDIT : View and edit files. EDLIN : View and edit files. EMM386 : Load extended Memory Manager. ENABLE : Recovery console command to enable a disable service or driver. ENDLOCAL : Stops the localization of the environment changes enabled by the setlocal command. EXPAND : Expand a Microsoft Windows file back to it's original format. EXIT : Exit from the command interpreter. EXTRACT : Extract files from the Microsoft Windows cabinets. FDISK : Create the partitions on the hard disk drive. FIND : Search for text within a file. FINDSTR : Searches for a string of text within a file. FIXBOOT : Writes a new boot sector. FIXMBR : Writes a new boot record to a disk drive. FOR : Boolean used in batch files. FORMAT : Command to erase and prepare a disk drive. FTP : Command to connect and operate on a FTP server. FTYPE : Displays or modifies file types used in file extension asociations. GOTO : Moves a batch file to a specific label or location. GRAFTABL : Show extended characters in graphics mode. HELP : Display a listing of commands and brief explanation. IF : Allows for batch files to perform conditional processing. IFSHLP.SYS : 32-bit file manager. IPCONFIG : Network command to view network adapter settings and assigned values. KEYB : Change layout of keyboard. LABEL : Change the label of a disk drive. LH : Load a device driver in to high memory. LISTSVC : Recovery console command that displays the services and drivers. LOADFIX : Load a program above the first 64k. LOADHIGH : Load a device driver in to high memory. LOCK : Lock the hard disk drive. LOGON : Recovery console command to list installations and enable administrator login. MAP : Displays the device name of a drive. MD : Command to create a new directory. MEM : Display memory on system. MKDIR : Command to create a new directory. MODE : Modify the port or display settings. MORE : Display one page at a time. MSAV : Early Microsoft Virus scanner. MSCDEX : Utility used to load and provide access to the CD-ROM. NETSH : Configure dynamic and static network information from MS-DOS. NETSTAT : Display the TCP/IP network protocol statistics and information. NLSFUNC : Load country specific information. NSLOOKUP : Look up an IP address of a domain or host on a network. PAUSE : command used in batch files to stop the processing of a command. PING : Test / send information to another network computer or network device . POPD : Changes to the directory or network path stored by the pushd command. POWER : Conserve power with computer portables. PRINT : Prints data to a printer port. PROMPT : View and change the MS-DOS prompt. PUSHD : Stores a directory or network path in memory so it can be returned to at any time. QBASIC : Open the QBasic. RD : Removes an empty directory. REN : Renames a file or directory. RENAME : Renames a file or directory. RMDIR : Removes an empty directory. ROUTE : View and configure windows network route tables. RUNAS : Enables a user to execute a program on another computer. SCANDISK : Run the scandisk utility. SCANREG : Scan registry and recover registry from errors. SET : Change one variable or string to another. SETLOCAL : Enables local environments to be changed without affecting anything else. SHARE : Installs support for file sharing and locking capabilities. 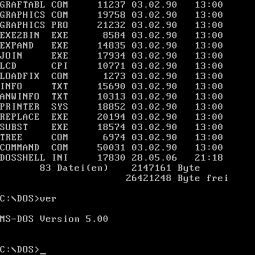 SETVER : Change MS-DOS version to trick older MS-DOS programs. SHIFT : Changes the position of replaceable parameters in a batch program. SHUTDOWN : Shutdown the computer from the MS-DOS prompt. SMARTDRV : Create a disk cache in conventional memory or extended memory. SORT : Sorts the input and displays the output to the screen. START : Start a separate window in Windows from the MS-DOS prompt. SUBST : Substitute a folder on your computer for another drive letter. SWITCHES : Remove add functions from MS-DOS. SYS : Transfer system files to disk drive. TELNET : Telnet to another computer / device from the prompt. TIME : View or modify the system time. TITLE : Change the title of their MS-DOS window. TRACERT : Visually view a network packets route across a network. TREE : View a visual tree of the hard disk drive. TYPE : Display the contents of a file. UNDELETE : Undelete a file that has been deleted. UNFORMAT : Unformat a hard disk drive. UNLOCK : Unlock a disk drive. VER : Display the version information. VERIFY : Enables or disables the feature to determine if files have been written properly. VOL : Displays the volume information about the designated drive. XCOPY : Copy multiple files, directories, and/or drives from one location to another. 0 Response to " Arti Kata di Perintah DOS"